We value our cell phone a lot. After all, it’s our precious means of contacting others immediately. Whenever, we leave our home, we check without fail if we are carrying our cell phone or not. But while we are out and have to contact someone urgently and the charge of our cell phone is about to finish, that’s the moment, when we realize the importance of our cell phone charger! Without the charger, our cell phone can become useless. But we keep thinking of our phone and not the charger. But the fact is that we should value our cell phone charger just as we value our phone. However, we don’t do that and then chargers are often misplaced, keep lying in unknown places and finally get lost. It’s a real frustration when we don’t find the charger and we have to charge the phone, because without a charge, our phone is merely a dead piece of plastic, metal and glass, with which we just can’t do anything. All in all, we need to keep our chargers secure and now, someone has created an innovative product for this purpose. Terry Gilbert has created a Charger Cuff which will keep your charger in your desired location, from where it won’t be misplaced or lost. 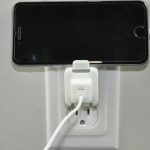 The Charger Cuff can be installed over your charger where it’s plugged in and it’s screwed in securely, so that no one can take it out and the chances of it getting misplaced are eliminated. 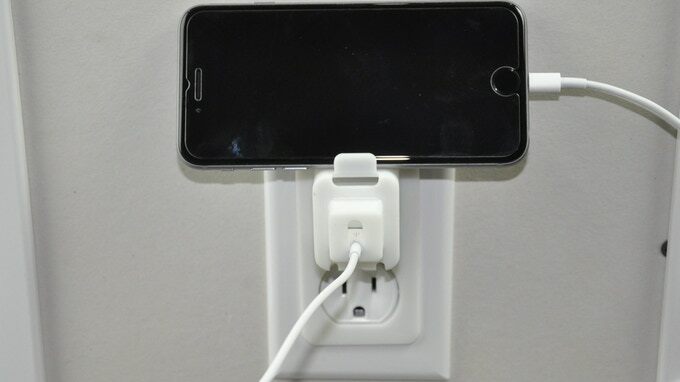 You just have to find out a location which you find the best for charging your phone. Once you plug in your charger there, secure it with the Charger Cuff and you are done! Your charger and cable are now safe. The Charger Cuff has been designed for the iPhone OEM charger and USB cable, and as long as your charger is of that size, you’ll find no problem in installing it. If it’s not, you can claim for one of their numerous rewards which contains and iPhone size charger and a USB cable. So also, currently it has been designed for the type A electrical outlet; however, they will soon be designing it for type B rectangular outlet too. The Charger Cuff has a kickstand & pad which will help you place your phone securely while getting charged instead of lying randomly with a risk of getting disconnected from the charger. So, what are you waiting for? Support the Charger Cuff campaign so that you can get their attractive rewards and ultimately the product in your hand soon.